Below I walk through a bit of the process, the content, and the journey of creating this piece and at the end please enjoy the time lapse video of me creating this awesome mural. Here I am rolling on a layer of gesso. Since the mural is almost entirely historical photo and illustration based, I planned the piece in photoshop through organized layers that loosely represented the last decades. I found photoshop both forgiving and faster to move the elements around the composition. When I got to Valparaiso, I laid a grid over my "road map" in photoshop that represented every 4 ft. in real life. I then used thumb tacks to drop lines every 4 ft. across the mural. On the lines, I then marked with a black dot every 2 ft. down. I was able to use my iPad to then quickly and loosely draw out the entire composition in charcoal. Starting to draw in the Diversacut 2110A. The historical timeline goes from left to right starting with William Urschel's first machine, the Gooseberry Snipper that he invented in 1908, all the way to the most iconic Urschel modern day machine, the Diversacut 2110A. I was super excited after this day. I felt like I nailed this old time shop guy and he didn't change from this point on. Loosely mapping in the robot and surrounding area. It took me several layers to match that old school "Urschel Green" that you can find on the walls throughout their old plant. The harsh light late in the day proved to be hard to work around sometimes but is the reason I put so many layers of UV protectant varnish on at the end. This day was perhaps the hardest of the whole project. It took 3 hours of mixing the blues the day prior and then 6 hours of painting to complete the first layer of that deep blue gradient. I used a 4" brush and by the end I was using my left hand. This is what I look like when my paint brush stops working properly. Left hand painting, I thought my right arm was going to fall off this day. Moving that 4" brush quickly enough through the color transitions proved to be quite the workout. I made my own Translicer knife blade template. I thought the Translicer form mimicked the Eskimo Pie Machine quite well. There were some problems early on keeping the room at temperature. This day I think it was about 48 degrees in the room. Thankfully they got that problem resolved during that super cold stretch in February. Halie came and watched me paint this day. I listened to 104 episodes of This American Life while painting this mural. I ate a peanut butter sandwich almost every day for lunch. Oddly enough, I used the handle of the most expensive paint brush I had with me as the knife. The mural looks quite a bit different without that overhead lighting. In the studio I can normally move paintings around to get the proper angle to execute smooth brushstrokes but with this piece I just had to move my body. This is the operating principle for the RA and was a ton of fun to paint. This operating principle has an interesting mixture of transparent forms moving into more opaque forms as the "food" items move through the machine. I thought it was a subtle but cool way to create and emphasize the direction of movement the food takes through the machine. As an outsider, it was hard to distinguish between the machines and their overall importance within the company history. I want to give a shout out and thank you to Dave Tipold and Sheila Mikkelson for helping sort through all of the history to find the bits of gold. They were my go-to Urschel experts throughout the entire process. I also want to give a shout out and thank you to Rich, Mike, and everyone else at Tonn & Blank. Although the project was a secret to Rick Urschel and the outside world, the people at Tonn & Blank got to be with me at every stage. From the first day of laying color down when they were giving me crap for just painting "clouds" all the way until the end when they started giving me crap for "showing off" when I was ghosting in all the subtle details. They were a fun group to be around and certainly made my three months away from home easier. Out of over 23,000 time lapse photos this was the only one I found where I was looking at the camera. I can tell this was morning because there was still coffee left in the thermos. I am working on the Eskimo Pie Machine which was invented in the 1920's as a point of sale machine that created Ice Cream Sandwiches. In this photo I am working on the Gooseberry detail in the upper left corner. This detail is directly inspired by an piece of early marketing material that was illustrated by William Urschel in the early 1900s. It couldn't be an Urschel Mural without some representation of food being cut. This is the most obvious representation of food in the entire mural and comes from 1938 Bean Snipper Patent. Another shout out ant thank you has to go to Bill Schott. Bill provided a ton of support throughout this project and was my go to guy for anything I needed. The overall composition of this piece has a very intentional symmetry to it and almost takes on a "W" shape. I used charcoal which would erase easily to map out final placement of objects dark enough so when I stepped back I could make the final judgment on exact size and placement. In this photo I am drawing the blueprint for a Comitrol Impeller. I'm starting to put on the final touches. I used 8 Layers of protection over the final layer of paint. The first coat was an isolation layer and then I sprayed 7 layers of varnish over the top. It is hard to tell in photos but I used a combination of satin and gloss varnishes to give the painting a really beautiful velvety semi-gloss finish. Also because of the south & west windows along with the main entrance coming in from the north, I created a gradient effect to the varnish so it has a bit more of a satin finish on the left side and transitions into a semi-gloss on the right. Without this effect, someone walking into the room for the first time would have had a harder time seeing the mural due to the glare. Using satin varnish I was able to tone that down and it gives the viewer more ability to see the entire piece upon walking in. My parents came over to see the final product. In the negative space and shadows there are subtle micro paintings that include this painting that looks very "Justin Vining" but I promise it is directly inspired by an early William Urschel Illustration of this roundhouse. The roundhouse was made for Kenneth's 8th birthday in 1926 (William's youngest son) and it was made by William carving three sizes of wooden forms. He then poured concrete by hand into the forms, allowed them to cure, and then assembled them to make the house. The roundhouse was made at the old factory at 58 S. Napoleon St. and then brought to their home a few blocks away at 158 S. Napoleon St. by a wagon and horses. When the wagon broke, it was rolled the rest of the way by a group of guys from the shop to the backyard where it stayed until it was moved to it's present location in front of the Calumet Ave office. As a side note, William got his art degree from Valparaiso University and then studied at the Art Institute of Chicago. Through the process of creating the mural I felt like I got to know William a bit and enjoyed seeing much of his art and illustrations that are still around the Urschel Plant. The Knight Twister which was built at Urschel by Urschel employees, was not only flown, but was turned into a kit airplane that was sold commercially. Also hidden in there is Urschel Field which was the first airport in Valparaiso and was located on the land just west of the Calumet Ave. Urschel plant. Behind the Eskimo Pie Machine you can see a subtle William Urschel painting of a winter scene that he painted for the cover of a Rotary Club Calendar in 1912. Some elements: The Gooseberry Snipper, Original hand drawn William Urschel Blueprints with his handwriting & signature, the original Urschel Plant on Napoleon St. There are 2 houses painted, one obvious and another ghosted. The one right next to the plant, William supposedly stayed in for a while and the other home he built and lived in for many years. The Model 30, which was invented in the 1930s but some are still in use today. In fact, as Urschel was moving into their new facility I saw some new Model 30 hoppers being placed on the shelves. It is mind blowing to me that an invention can stand the test of time like that. Also in here, an old scene from the original bronze foundry with a "JV" landscape ghosted into the black on the left of him and a William Urschel Mountain Scene ghosted in on the right. Some of the other blueprints include, 1909 Gooseberry patent, 1937 Model R, 1918 an old William Urschel Harvesting machine, 1946 Universal Joint. The welder guy and drill press guy have to be my favorite part of the entire piece. Those who are familiar with my work know I have never painted people before. This task was a bit intimidating but I stepped up and felt like I hit these two guys out of the park. They look period correct to me, 1950s/60s and have this certain timelessness quality about them that I enjoy. I also got a little crazier with the drill press and stylized it in a more "JV" manner. With the Urschel machines I did not want to get crazy, I felt that would be doing their history a disservice so I painted them with more realistic proportions and a fair amount of accuracy. But with the drill press I went crazy and love how it turned out. This is also the most intentional and "painterly" portion of the mural. I really like how everything in this portion has a freshness about it. Also, I was super excited the day I further illuminated the welder guys clothes & face, I felt like that light really set things off. Other elements in this portion: an early CC (which cuts most of the worlds potato chips), the Calumet Ave. building also built by Tonn & Blank in 1957. A comitrol cutting head filled with ceramic dipping fluid. An operating principle hand drawn by Gerald Urschel in 1964. Also barely visible in this photo are the subtle implied portraits of Joe, Kenneth, and Gerald Urschel. The moon is also inspired by the Urschel Logo. 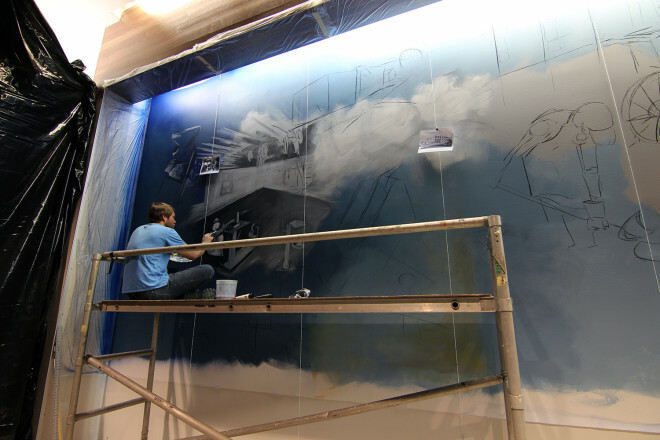 As the mural moves from left to right, it also transitions from black and white, to creams, to sepia tones, to toned down muted colors in the 1950s, to more saturated colors on the right side. It is subtle but was an idea I had from the start and I believe helps further emphasize the passing of time. Probably the most interesting thing from this side is that I decided to paint William Urschel as the robot operator. This was probably the most nervous I was throughout the entire process. Rick Urschel had one request when I painted this and that was to not paint people, specifically portraits of his relatives. I deliberately broke that rule with this addition. The challenge I had with this figure was the other 4 figures are pretty ambiguous, I was not trying to represent anyone in particular. 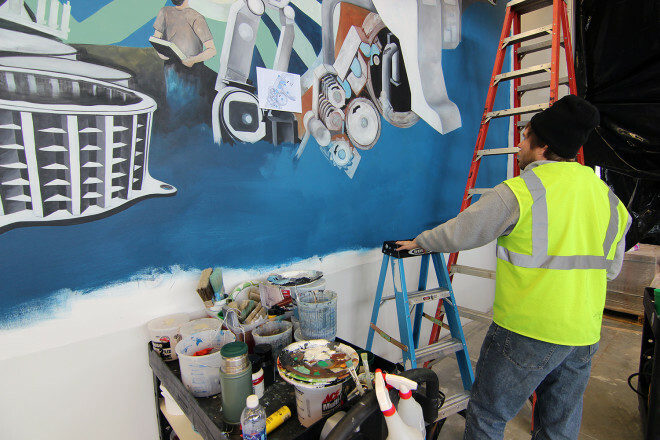 In the early photos of the mural you could see that I had actually painted the real robot operator, Mr. Sutton, into the painting. I didn't like that first 4 figures were general and this one was specific. I started going through my old Urschel photo references to find a better suited "ambiguous" person. I came across this old portrait of William Urschel and like lightning striking, I had to paint him in. Some other elements, the translicer cutting blade is also a world map with dots representing the Europe and Asia Urschel offices. The blueprints include 2 Comitrol units, a Translicer 2000, the Model M6, a CCXD and the blueprints of the new Urschel World Headquarters. Bob Urschel, Me, & Rick Urschel with the finished mural. Finally, signing the painting had to be one of the more surreal out of body experiences I have had to date. Let me set the stage a bit. So Rick Urschel, the President/CEO, gave me full creative freedom with this project. Not only that, he didn't want to know anything about it or see it until it was finished. To spend months working on a project and when the moment came to finally show him I got this weird combination of nerves combined with incredible amounts of pride. I asked Rick to come see it for the first time when I was ready to sign it. Watching his face see the mural for the first time is something I will never forgot. It was a great combination of shock and happiness. I think he said something to the effect, "This is .. amazing". Obviously, a big sigh of relief for myself. I watched him for a little longer explore the composition himself and then I walked him through many of the more subtle details. Then came time for the signature, let me just say that it was very difficult for me to be "in the moment" with the painting because of the excitement of sharing the painting with Rick for the first time combined with the emotions that come with spending months of my life creating this piece that I am about to sign. As I started signing and moved into my last name, I actually spelled my name WRONG. It was super embarrassing but easily fixed. I think it goes to show how high the emotions actually were for me. I did a good job of holding back tears of joy while Rick was there but there were several times during the course of this project that I certainly was overcome with emotion. I understand what a huge honor this was for me and I didn't take the challenge lightly. I am incredibly proud of the final piece and thoroughly enjoyed my time as part of the Urschel Family. Thank you Rick for believing in me and giving me this incredible opportunity, it was a journey I will never forget.